Royal Wedding via Facebook and Twitter – Is Social Media Here to Stay? Yes, without a doubt, the Royal wedding is history in the making. But so is something else here. With all the online interaction over the wedding, one must ask if we really need TV networks to cover such events as this? Right now maybe…But will we down the road? Not too long ago, major TV networks snubbed any Social Media applications. After seeing that this is what “WE” the public want, and that this is how “WE” communicate, these social “prehistoric” media types broke down, finally “seeing the light”. The major media outlets have jumped with both feet landing in the real world of cyberspace via Social Media applications. For real time evidence, just look at how TV executives joined the Social Media band wagon for the Royal wedding. They widely encouraged viewers to interact with their television broadcasts via Facebook and Twitter. NBC allowed for people to share their thoughts and comments with well over 7,000 people “who have already signed up for the “Event” on the Today Show’s Facebook page.” You could also join more than 32,000 people who followed NBC’s @royalwedding Twitter account live as the wedding progressed. In reality, many people will still turn the TV sets on at home. However, statistics are showing more and more people are turning on their iPads, smart mobile phones, laptops and even old desktops to connect to the Internet for many live events. This will only keep growing as the trends catch on. Really, if one thought about this, and I am sure wheels are turning in the TV network boardrooms, that the need for reporters, journalists, and radio and TV announcers may decrease. You can bet this is being discussed in colleges and universities around the globe. Could Social Media replace how we get the news? I think it just might…In fact, has it not begun already? Nine dynamic chapters that guide you through your next “modern marketing campaign”. Chapter one explains how marketing is changing pointing out things you need to know before you begin planning your next promotion or campaign. You will learn how to make money from a website by page views, optimize the values within search engines (SEO) and how the main players in social media can help you go deeper inside the communities spreading the word of your company or product. Even though email marketing has been around forever, it seems, this book sparks a new interest showing “many advantages” and the authors “walk you through every step towards a successful email marketing strategy”. Having your own sales people working for you online is easy when you create an “affiliate marketing program” that is covered in Chapter seven. The advantages of having an “army of salesmen all over the world” promoting for you is explained in easy to understand terms in this chapter. This is followed in sequence with Chapter eight wherein you learn about the world of “online advertising” as you will be able to “plan, implement, test, and optimize” what you setup with your online advertising. I really like the way this book is set out. The Table of Contents leaves nothing to imagination. The Preface wand Chapters have extensive headings that guide you through the various topics so that you can easily look something up and jump right in on that subject. For example, in Chapter two’s listing you will find headings such as: Press Releases. Then followed with sub-headings: Press Releases in the 21st Century, When to Write a Press Release, Stand Out From the Crowd and so on. Every chapter tags your interest and keeps you coming back as a reference point for helping you develop your own online marketing campaign. This book is for those who “have a web site and…want to promote it”, or anyone else who wants and/or needs to learn this amazing subject of online marketing. 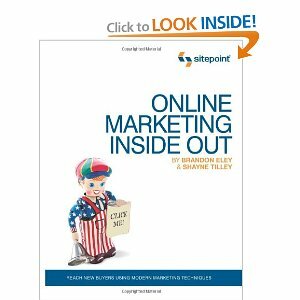 Even if you are already doing online marketing and feel fairly successful, this book will take you to the next level of expertise and guide you in directions you may have possibly passed by. I was a journalism student in the early 1970’s. I have been working with computers since 1972. I have been on the Internet since the very early 1990’s. I currently teach computers courses at a local college. I write technology columns for magazines, and I review technology and software books for O’Reilly Publishing. I have been blogging since 2005. However, I must say, that this is the most precise book on how to be in tune with today’s journalist culture I have ever come across. After reading this book you will not wonder why this book is so widely used in colleges throughout North America. Briggs states at the onset that “Journalism is about people, not technology.” In this book you will learn the inner secrets of how to connect with your readers. You will see how this connection spreads to more and then more readers. Of course you will learn the why and the how that technology is involved so deeply in today’s journalist’s work. You will learn how technology and the Internet are utilized in a career in Journalism. Briggs covers all the bases, from the importance of advanced and micro blogging, making audio reporting visual, to the techie equipment you will need for the job. In this book he teaches how to “build an audience”; how to maintain that audience. Briggs demonstrates details of why setting up a Facebook or Twitter account is a must. The book is filled with references and articles by several top bloggers and online editors. Many innovative companies open yet other doors to peek in and learn more interesting tips and tricks. The contents of this book cover every aspect of journalism today, information that would take years of experience and study to learn otherwise. If you are at all interested in writing or becoming a journalist, especially writing for an online publication, or even if you are a seasoned journalist and need to get up to speed with what is out there today, this book is a necessity. Don’t forget to purchase a yellow highlighter for this read due to the many topic points where you will find yourself saying, “I didn’t know that”. Let’s face it, now is the time to lose the ink and newsprint version and get with the times. Many magazines and newspapers are seriously looking at this concept, including the New York Times says it is going “out of print sometime” and you can bet so will the Toronto Star and the Globe and Mail. The new LAMBTON SHIELD paper is well laid out and works well with live links to reference sites, including video. It advances Social Media Marketing the way it is supposed to with adding clickable buttons for readers to share an article to Facebook and Twitter. There is also an RSS feed link. Comments online by readers sometimes make for better reading than the original article and this paper has cashed in on this new concept. All that is needed here are more active readers, but they will come and soon. The Lambton Shield team the best media people around. J.D. Booth as Publisher/Editor, whom I have followed for many years, is well known to people in the area. Barry Wright is an Editor/Writer and joins the team with many years of experience, both as a journalist and a radio newsroom person. Barry also has a live show on TVCogeco every Wednesday night which is a top rate interview show. Sarnia is quickly becoming a “centre for the arts” and in that vibe, joining this team comes Hazel Rogers. Hazel is the lead art educator at Lawrence House for the Arts, and she is editor of Arts/Entertainment/Culture on this team. Expect to be on the cutting edge of current information about what is going on in Lambton County with the arts, entertainment, and culture scene. Expect and get the best in the current news and happenings of Sarnia Lambton. Bookmark this site NOW by clicking HERE.